We thoroughly tested the Bauer Nexus 1Ns last year – and found them to be an outstanding pair of skates, so we were obviously keen to get our hands on 2018’s Nexus 2N. Our Nexus N2’s are a 8.0 and tipped the scales at a featherweight 780 grams. That shaves a little weight off the N1, and places the N2 as one of the lightest elite level Bauer skates on the market. I’ve got a wider foot, which is exactly what the Nexus range caters for – and the 2N doesn’t change this approach. The skate is noticeably wider than anything in the Supreme or Vapour range. Looks wise, the 2N is visually slightly busier than the 1N – but Bauer haven’t overdone the details. The finish is impeccable, and the contour lines make the skate look a little more streamlined than its predecessor. I’m always delighted when I can pull on a pair of skates and immediately feel at home – and the 2Ns deliver this experience straight out of the box. The deep heel pocket firmly locks my foot into place – even though my wide feet lack the pronounced arch that generally helps a boot feel snug. 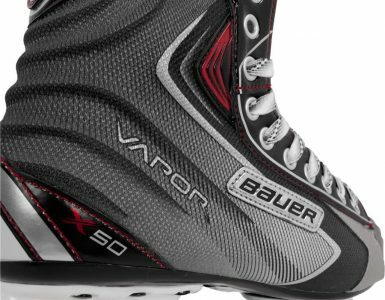 Balancing the right fit with the space that’s needed for a wider foot is a real science, but I was pleased that Bauer have got it right again – there’s plenty of room for my toes in the toe box and the midsection of my foot didn’t feel squeezed. The Nexus N1 was the first time, for me, that Bauer have really nailed an elite Nexus skate – and I’m happy to say they’ve built on an already great base with the N2. I’ve broken the skate experience down into the key components and the impact they have on the ice. Bauer haven’t just got lucky with their heel lock and fit on the N2, I know that there’s been continual player and skate analysis happening behind the scenes that’s seen the fit develop from the already impressive N1. 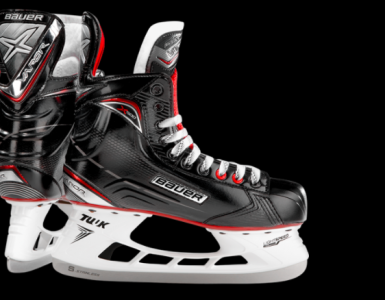 Gone are the days of just taking player feedback and adjusting boots accordingly – the N2 has been the subject of continual computer analysis, looking at the most efficient shape to provide the heel support and anatomical form required – while representing the very best power transfer through the body of the skate. A deep-V can sometimes feel slightly restricting – but not in the N2. The exceptional power transfer is so noticeable that putting on my daily skates after this test took a little readjusting back down to! We’re going to talk power transfer again – but this time through the lens of an exquisitely formed quarter package. I’m not sure if I just got lucky with the N2s, but I could skate these comfortably without moulding. The anatomical design means the boot is an outrageously good fit out of the box – and actually, when I did bake the N2s – the change was so small, the responsiveness change would probably only be noticeable through further computer analysis. 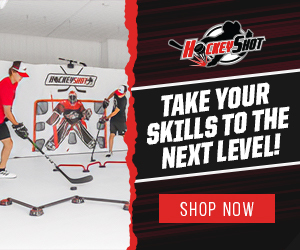 Bauer have always said the Nexus is designed to be a snug fit, and the Curv composite continually proves to be one of the very best ways to deliver a perfect fit in elite level skates. 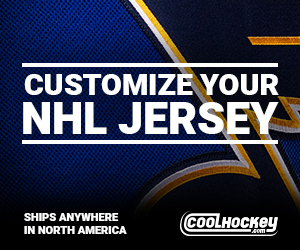 The N2 development isn’t the only noticeable thing when you’re on the ice. Bauer’s Form-Fit+ footbed has continued to evolve from the original we got used to all those years ago. Now, the Form-Fit+ is also computer designed – with the goal of reducing lost energy between your foot and the ice. The result is an extremely comfortable bed that combines a mix of densities and grip to ensure power is transferred though the centre of the outsole – focusing that power into the holder and steel. It’s easy to think you can get away with sticking any memory foam footbed in your skates and hope for the best – but the difference that this level of perfection offers is really noticeable. Combined with such a well designed boot, this level of footbed technology is going to changes an excellent skate into a game-changing world-class skate. I’m already a fan of the quick release Lightspeed Edge – and while my speed of change requirements aren’t up there with the pros, the convenience is always good. The Lightspeed Edge is around 3mm taller than a lot of other pro-level holders – and it’s noticeable. I rarely bottom-out when I’m turning, but when I do, I’m usually picking myself up wishing for something that was just a fraction taller. If you’re into pushing tight turns – or just want to confidence to know you don’t have to hold back at speed, the Lightspeed edge, twinned with Lightspeed steel is going to tick all the boxes for you. I thought the N1s were brilliant – and, if you’d asked me honestly if I thought the N2s could build on that, I’d have said no. But, how wrong I’d have been. 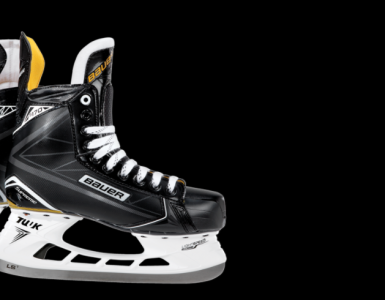 Bauer have shaved weight, they’ve improved the looks, they’ve increased power transfer and they’ve upped the comfort. This is an out-of-the-box winner for me. If you’re sometimes cramped with other skates and want something that’s going to be snug, without being restrictive, I’d urge you to take a look at the N2s.